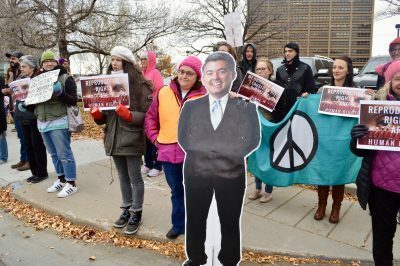 Members of Colorado’s politically prominent Neville family, which is known for its pro-gun agenda, are opposing a ban on bump stocks, a type of gun attachment that allows semi-automatic rifles to fire faster, simulating fully automatic weapons, which are banned for civilian use. The idea of banning bump stocks received rare bipartisan support in the wake of the tragic mass shooting in Las Vegas, in part because the alleged gunman used the device to fire so many bullets in a short amount of time. When asked about limiting access to the gun accessory, many Congressional Republicans gave supportive responses, which ranged from favoring total ban to being open to hearing legislation on the matter. 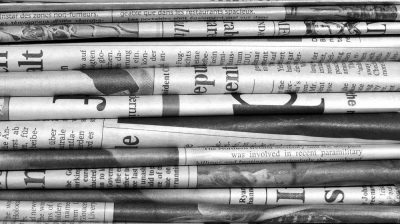 Even the NRA stated that it believed any gun accessory that allows a semi-automatic weapon to behave like a fully automatic rifle should be “subject to additional regulations,” although they clarified a few days later that the organization opposes an outright legal ban. 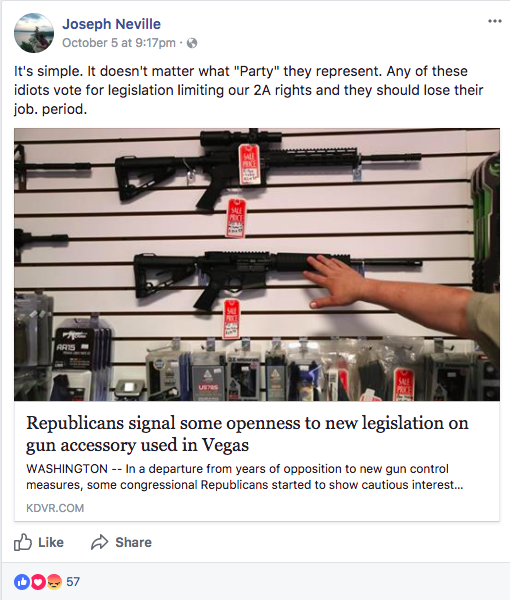 State Rep. Patrick Neville, who’s the Republican leader in the Colorado State House, and his brother Joseph Neville, a lobbyist who has worked for Rocky Mountain Gun Owners, were not pleased about what appeared to be an uncharacteristic softening on gun control from the NRA and members of their political party. 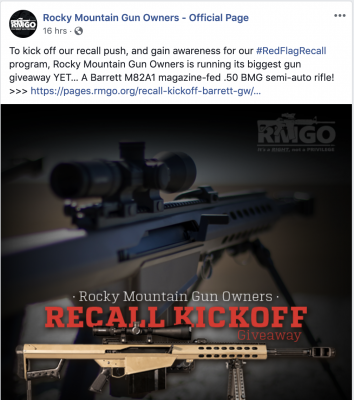 They’re the sons of Colorado State Sen. Tim Neville of Littleton, a prominent Colorado Republican who ran for a U.S. Senate seat in 2016 and has tried to roll back gun regulations in the statehouse. 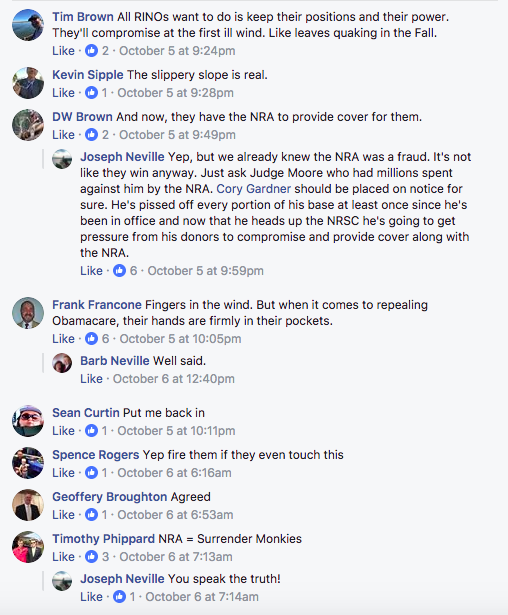 In the comment section, he went after the NRA, calling the organization “a fraud.” Barb Neville, the wife of Tim Neville and mother of Joseph and Patrick, also chimed in. She agreed with a commenter who said that Congressional Republicans have their “fingers in the wind” but that their “hands are firmly in their pockets” when it comes to repealing Obamacare. Patrick Neville seems to agree with the rest of his family. 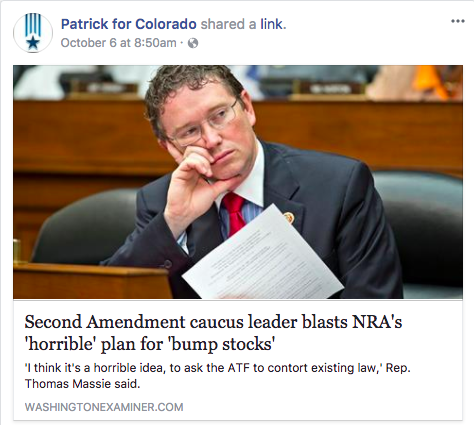 He shared an article entitled “Second Amendment caucus leader blasts NRA’s ‘horrible’ plan for ‘bump stocks'”.